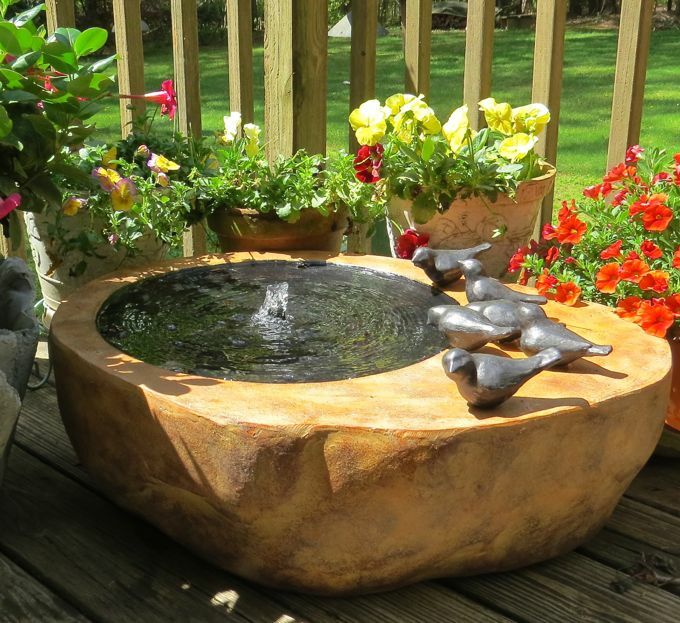 Why are Ground Bird Baths More Natural? Because Birds Bathe More Naturally at Ground Level! 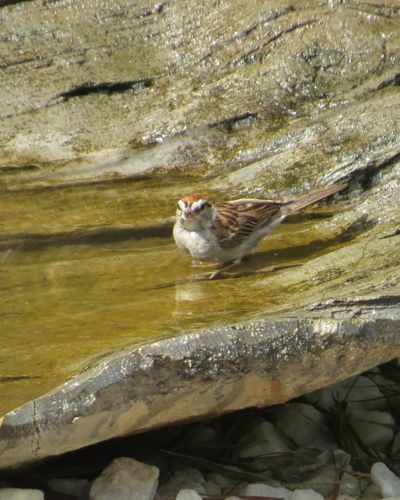 Think about it… before humans ever started offering bird baths for feathered friends, they got along just fine with shallow pools of water and puddles. Freezing temperatures likely created some problems as the shallows froze over, making it more difficult for birds to find water. The concept of eating snow for water seems logical- but if you’re a bird it’s pretty much half baked! The reason being is that it takes energy to convert the snow to liquid. This energy requires calories and it’s the calories birds spend all day consuming in cold weather. From dawn until dusk, most of the resident backyard birds will be at feeders and foraging for enough calories to make through another night. Calories provide the energy to keep warm, although nature has provided other mechanisms for that too! You know when puffed up, big fat birds are hanging around feeders and they resemble little fluff balls? Feathers are fluffed as a way to trap heat beneath them close to the birds’ body. It’s one of the main reasons for late summer/fall molt when they shed old and tattered feathers. New feathers are sturdy, sometimes even brighter and more effective at keeping the bird warm. So by offering shallow open water in winter, you help birds conserve energy. And since ground bathing comes more naturally, heated ground baths absolutely rock for winter! Easy to add a heater to an existing bath, or go for one with concealed heater- meant for year-round use. The Four Seasons Ground Bath is ideal for it’s size, rough texture and hidden heater. Birds will flock to it in frigid weather as the design resembles those natural shallow pools and puddles. It helps create a perfect winter habitat along with feeders and shelter, and once weather warms up, simply tuck the cord underneath the bath! 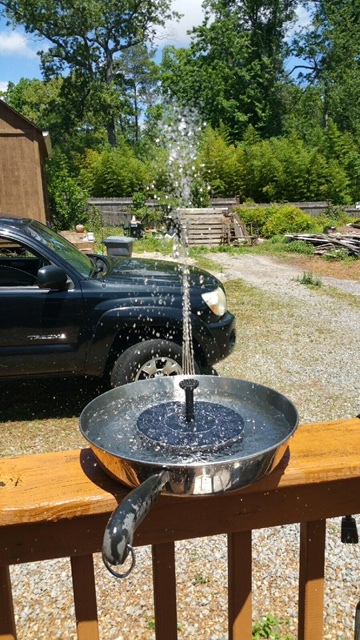 Could it be… the red neck version of a solar bird bath? Maybe so, but we’re betting birds can’t tell the difference and won’t mind one bit! 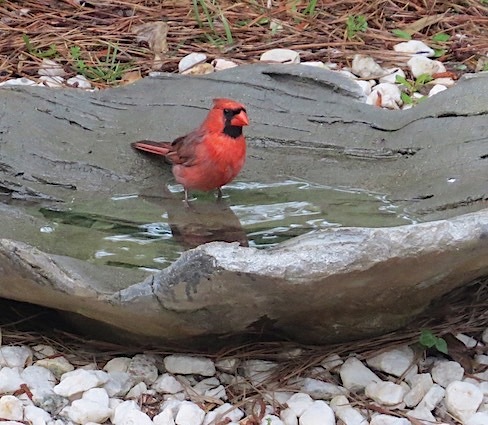 Because fresh water is the best (and easiest) way to attract feathered friends, just about any vessel, bowl, container or bird bath works- provided the water is fresh and not too deep. Yes, even a frying pan! 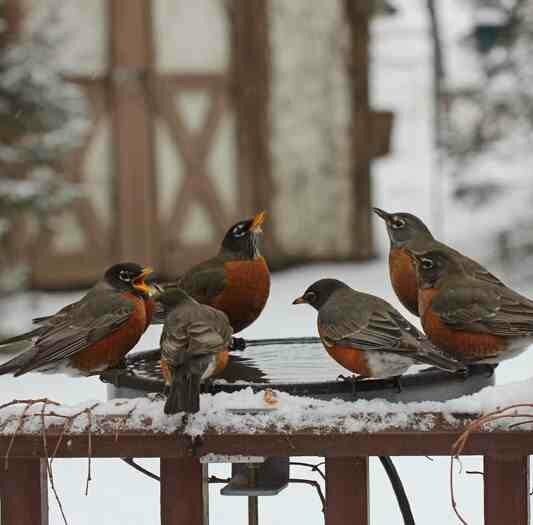 A major misconception that’s actually dangerous for birds, is birdbaths that are too deep. There’s a good reason birds use shallow puddles to bathe as water should be no more than about 2 inches deep. No need to fill your bird bath to the top, it makes a scary encounter for birds, especially juveniles in spring and summer. 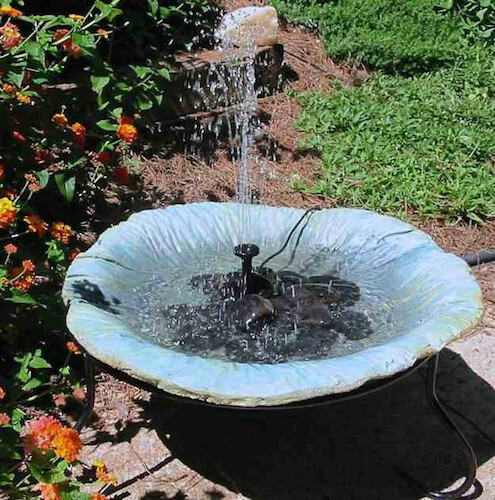 And if there were ever a few good reasons to keep bird bath water moving, think Zika, West Nile or EEE (that’s Eastern equine encephalitis) which are all mosquito-borne viruses. Solar bird baths absolutely rock for feathered friends as moving water acts as a visual magnet to entice them for bathing. Water stays fresher and nasty mosquitoes are unable to lay their eggs. 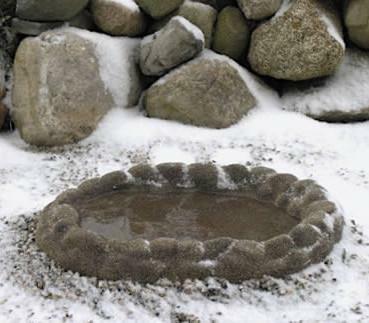 Speaking of rock (or rocks), placing a few stones or large rock in your birdbath helps birds with safer footing. Possibly even a lifesaver, the stones or rocks may prevent a drowning incident should water be too deep. 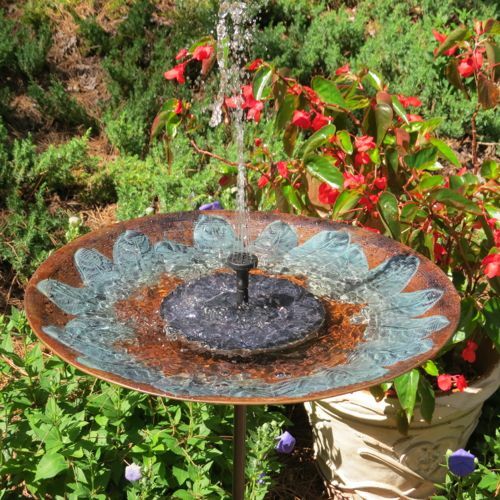 Solar fountain pumps are available separately and allow you to add them to an existing bird bath. 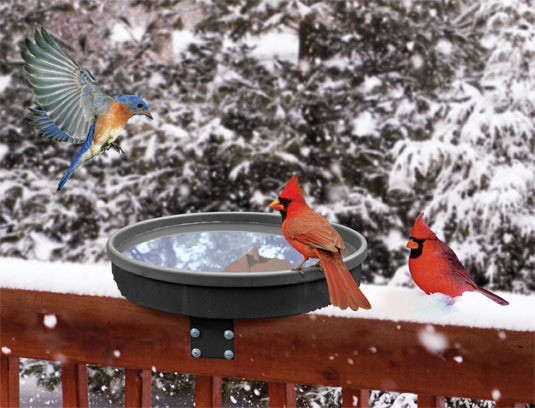 They create a whole new dimension for backyard birding that delights birds and hosts as well! 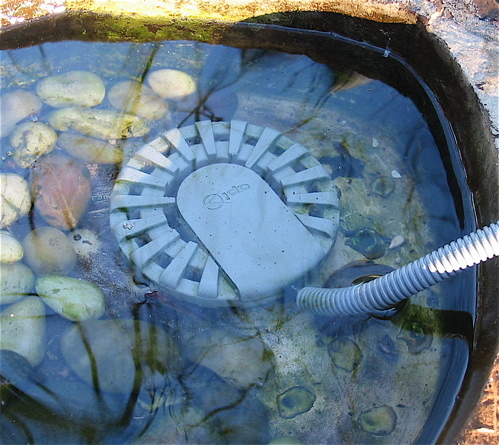 Shown above is the one-piece unit which sits completely in the bird bath. Note that panels must be in full sun to operate, only the pump beneath solar panel needs to be submerged. Another option is the separate solar panel (with 10 ft. cord) which allows the bath to be shaded while the panel is placed in sun. We prefer this as bath water is much more refreshing when cool, but the possibilities depend on your own set-up. Lots of options besides solar fountains exist for offering birds some moving water; leaf misters, rock waterfalls & bubblers, and drippers provide the same. Some operate via outdoor spigot, while others run on electricity. Whatever water feature you may opt for, we can promise the birds will love it… even if it happens to be a a red neck version solar bath in a frying pan! Why a Hanging Bird Bath for a Holiday Gift? We’re starting earlier with holiday gift ideas as there’s so many cool bird accessories and so little time. 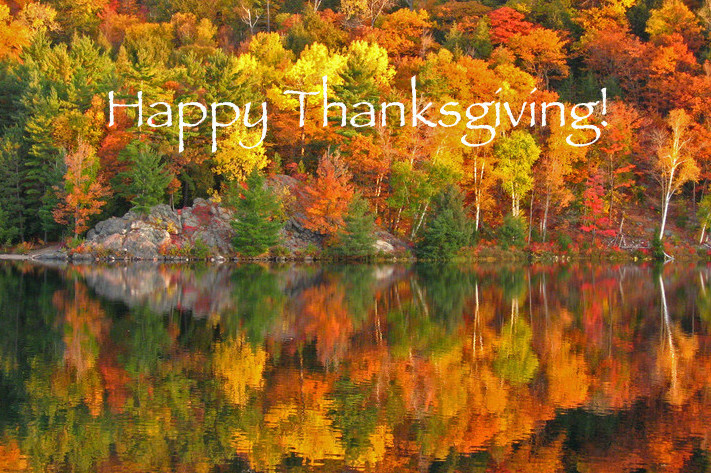 Do stay tuned for some pretty unique non-birder gift ideas too! Theme: The gift of nature can’t be matched, for it offers an innate connection that’s capable of soothing the soul and clearing the mind. Simply put, watching birds in the yard (or on the patio/balcony) removes life’s chaos! It has the capacity to form a bond between people which may not have previously existed. 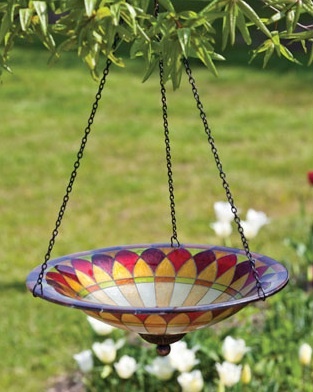 So why would a hanging bird bath be a make an awesome gift? Because they work in the smallest space, because birds adore and use them, because they come in all colors and styles suiting many tastes, including copper, ceramics and glass, but most of all, fresh water attracts more birds than any birdhouse or feeder! Enough reasons? 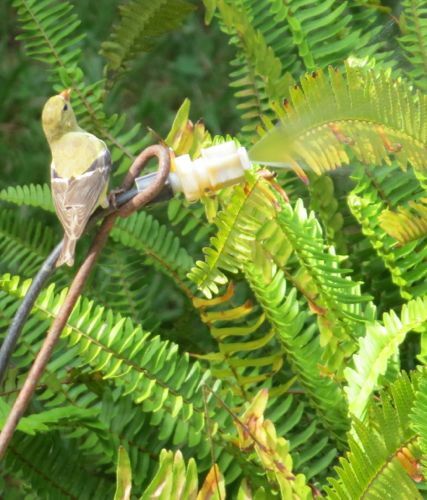 Birds who may not even use feeders will partake in fresh water at a hanging bath. 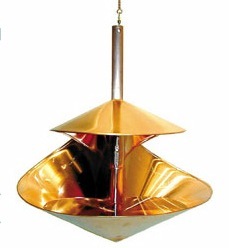 Lots of options for placement; hang it the from a tree branch, deck bracket, wall hook or garden pole with feeders. Feathered friends will find and frequent it daily. Hanging baths are ideal when their neighbor’s cat(s) is always in the wrong yard too…. grrrr, uggh! 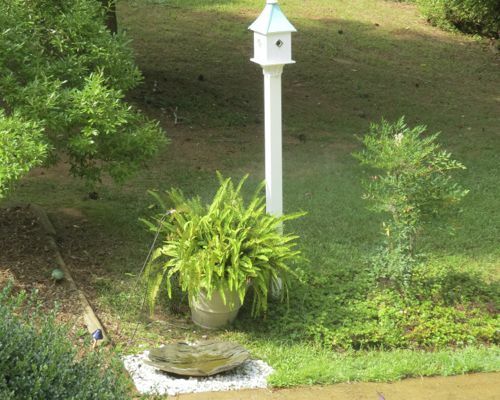 Civility is required because they’re a neighbor, but you want to have the birds too, so placing bird baths or feeders up high is always a good idea. Although birds do tend to bathe more naturally at ground level, a hanging bird bath makes a great gift even for the nature buff with no yard at all! birdhouse chick	Comments Off on Why a Hanging Bird Bath for a Holiday Gift? 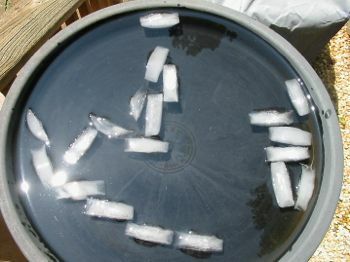 In the heat of summer there’s no better way to entice friendly fliers than with moving water! 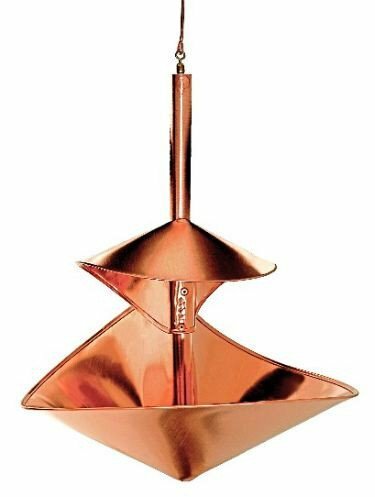 Accessories for bird baths and leaf misters will absolutely bring more birds (and butterflies) to the garden. Because they keep water from becoming stagnant, it stays fresher and mosquitoes can’t lay their eggs in it either. 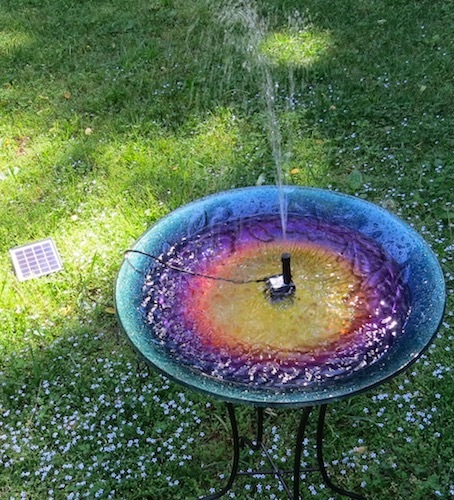 Both solar fountains and those using electricity recirculate water in bird baths. 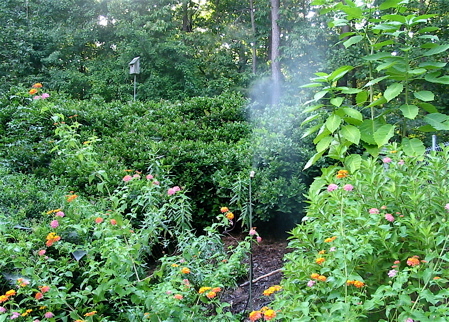 Drippers and leaf misters run off the outdoor spigot and although very slow and adjustable, do utilize a continuous water flow. They come as complete kits with everything required to be up & running in minutes… no kidding! Leaf misters offer lots of options for placement too. 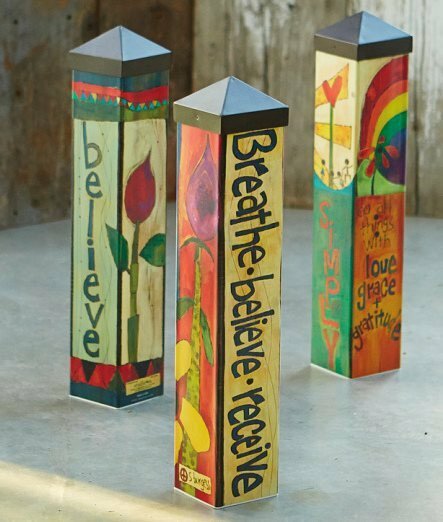 You can attach them to a branch or trellis, (50 ft. of rubber tubing is included) attach to a deck bracket or even a simple plant stake in the garden. 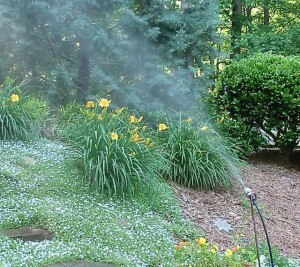 We prefer the latter as the mister may easily be moved around to benefit the garden by watering different sections daily. Butterflies especially adore the gentle mist, while hummingbirds and other songbirds like chickadees and bluebirds will wait for them to start each morning… it’s like a spa for them and makes a spectacular viewing experience for host too. 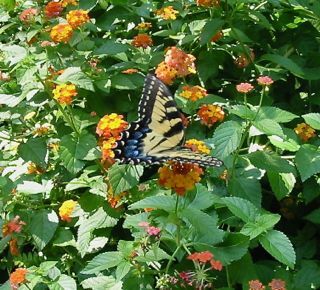 Place leaf misters near nectar-producing plants like lantana and enjoy the show! Moving water in a bird bath or somewhere in the landscape is the ticket to seeing more bird activity during warm summer months. In fall, simply pack them up and store away for next season. A one-time investment that promises to bring many seasons of use and enjoyment… and more winged activity to your place! 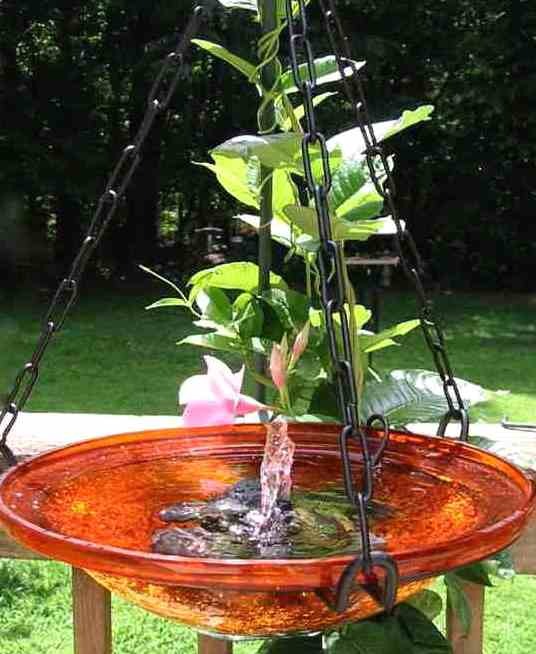 Try a Hanging Bird Bath for Mother’s Day! Did you find the perfect Mother’s Day gift yet? If not, best to shake a tail feather! Printing a nice big color photo of your gift and placing it inside a box that’s gift-wrapped is always an option if you’ve snoozed. 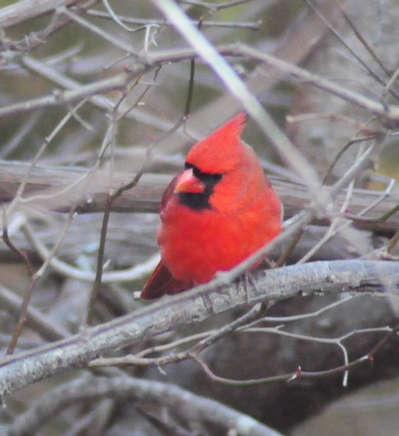 Long-lasting gifts bring the most joy, and birding gifts bring a relaxing connection with nature… unlike jewelry or little “chatchkas” that gather dust. 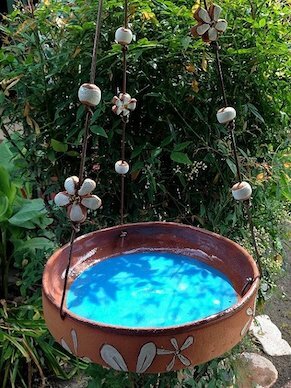 Perfect for any space in the garden or even on the deck, a hanging bird bath rocks! 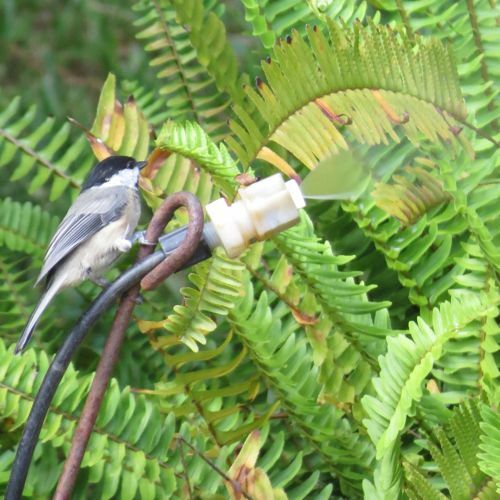 Fresh water entices more birds to the garden, and we can promise, whether a novice or experienced birder, Mom loves to watch her feathered friends! 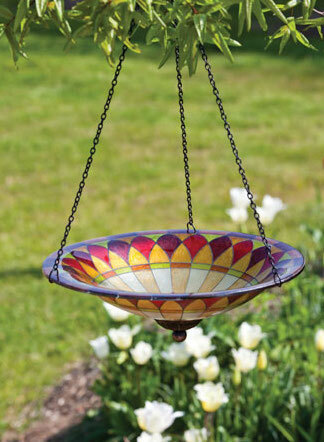 Hanging birdbaths can even be used as feeders, offering seed, suet, peanuts or fruit to lure migratory birds. The colorful Tiffany inspired bath above offers a traditional appeal, while contemporary styles in solid copper are most mod. 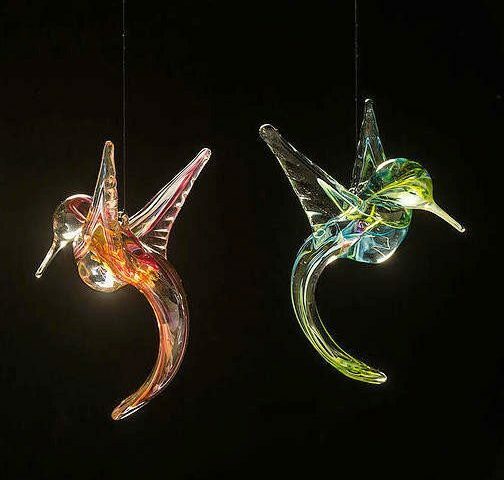 Ceramic hanging baths are offered in vibrant and whimsical styles… and all are sure to entice more beaked buddies to the garden! Why go to the trouble of finding something unique that will actually last? Because on her special day- which comes only once a year- she really does deserve something that brings smiles and real pleasure for many seasons to come!